Unexpected blasts of sun glare have been a common occurrence as the dank winter has turned to a promising spring that may just turn into a decent summer, fingers crossed. These unexpected bursts can be troublesome and many helmet manufacturers have addressed this problem with retractable sun visors. This has never sat well with Arai, their concern primarily on the recess that is necessary to house the drop down visor being a safety issue. The Arai answer is this: the Pro Shade system (PSS), a clear visor that fits all of their current full face models with a hinged smoked peak that drops down over the visor and acts as shade against the sun when you need it. It’s a simple but effective concept that gives Arai headers the choice to add a temporary sun visor system without having to lash out cash on a new helmet. The PSS fits the RX-7 GP, Rebel, Chaser-V, Axces II and Quantum-ST. The Max Vision visor comes complete with Pinlock that covers the majority of the internal view and prevents the inevitable fogging that conditions, where the PSS would be most useful, will cause. 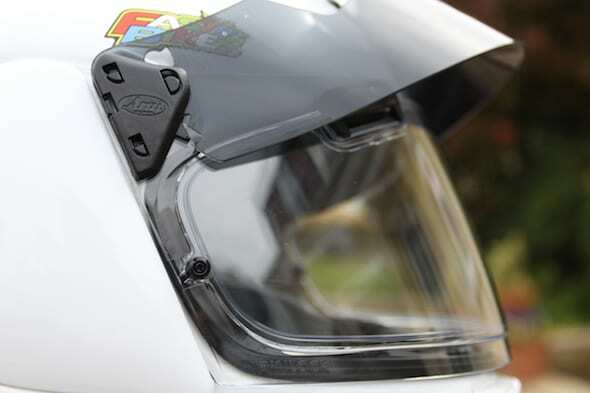 As with all Arai visors twin vents sit at the top that either the Pinlock or sunshade impede. At either end of the visor is the Arai developed bracket that attaches the shade to the visor. Not only does it attach, but also locks the visor in place when up and releases it via a tug forward to put it in the down position which sits just above the Visor so the two never meet, thus preventing scratching. Without question the Pro Shade build has Arai quality written all over it and is a brave change in direction from the alternative that is now becoming common place. Having worn Shoei’s GT-Air recently for local journeys, complete with internally based visor, I can see the benefit of the emergency sun shade. The two tone effect of dark to light takes some getting used, but there are real benefits while riding in unpredictable weather conditions. Pro Shade gives you this two tone view, though the coverage is less than the GT’s system which has a natural curvature to the face blocking more light from below. This is particularly handy when direct sunlight glares up off of a wet road. 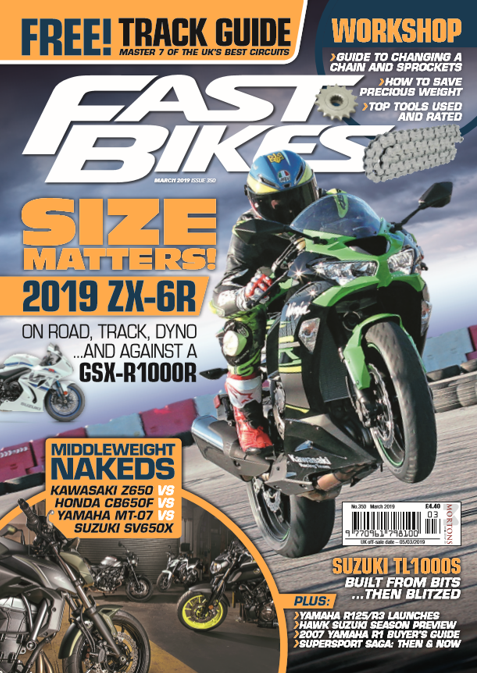 Obviously this is dependent on your riding position and Arai have identified that this system is better suited to the upright rider, more fitting to the naked riding position than tucked into your out and out sportsbike. When not in use Arai’s shade lifts easily enough and locks into place to act as a peak, at first like most things that are unfamiliar this is a bit of a faff, lifting and pushing to make sure each end locks into place so it doesn’t fall forward. When in position though it locks fast and creates an aerodynamic peak that does not create any particular drag at speed. In fact the peak is an effective quick-shade, nod your head down through the odd shaft of sunlight and it saves having to drop the full visor. When locked in the raised position it does look a little odd, and will get some getting used to as it will turn your RX-7 GP sports lid into a tour based peaked helmet that would be more befitting your GS than your Blade. However, if you are a multi discipline rider where’s the problem, its one helmet that suits both – a very definite saving there. It’s the safety angle that intrigues me. The fact that Arai have stood by their guns, providing an effective solution rather than reverse their initial statements as demand grew for drop down visors is to be applauded. The fact that eight of the forty-eight 5 Star rated helmets on the Sharp test, if that was to be considered a benchmark, have the internal visor system has not swayed their thinking. Indeed the Shoei GT-Air complete with Visor and the Quantum ST I have fitted the Proshade to are both 3-Star. However I do admire them choosing to go their own way and introduce what could be the next evolution in visor design. In conclusion it’s functional and it works, at £79.99 it’s not as cheap as a tinted visor but it’s a lot less than a new helmet. You won’t be seeing it on racers or trackdays because that is not what it is for, it’s a quick change environmental system to use when you just cannot read the weather. It may take some getting used to as its different, but where would we be if nobody did anything different – still wearing leather flying helmets and averaging at 60mph around at IOM TT I expect. A very well written review of the Pro Shade helmets. Though these helmets are a bit expensive but they are a much more safer option in the helmet department. While motorcycling, you never know when you have to come across unpleasant weather conditions and this helmet makes sure you are not distracted by the sun beams. Just don’t as I did forget to lock the main visor even at 90mph visor completely ripped off and that was £80 down the m53.